Sharing more than 200 never-before-published full-color photographs from his personal archives, bestselling author Erich von Däniken provides clear evidence of ancient alien contact and technology among the archaeological sites of the Maya as well as other ancient cultures. He reveals how the “gods” immortalized in Maya sculptures, carved reliefs, and myth were not supernatural beings but technologically advanced visitors, astronauts who gifted the Maya with their sophisticated understanding of calendar time and cosmology. Examining stone carvings and statues from many Mesoamerican sites such as Palenque, Chichén Itzá, and Teotihuacán in Mexico and Tikal in Guatemala, von Däniken reveals the astronaut technology—helmets, tanks, hoses, keyboards, rockets--clearly illustrated in these ancient depictions of the gods. He explores the similarities of Plato’s writings with the Chilam Balam books of Mexico and compares “ancient alien” features in myths around the world, paralleling how mercury is mentioned as a fuel ingredient of flying machines in ancient India with the discovery of mercury at Copán, Palenque, and Teotihuacán as well as in the grave of a Chinese emperor and two Egyptian graves on Nabta Playa. 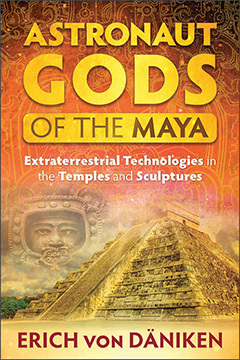 ASTRONAUT GODS OF THE MAYA: Extraterrestrial Technologies in the Temples and Sculptures By Erich von Däniken. 272 Pages. 6x9 Paperback. Illustrated.